The clip is from Bob Costas' show, and he is hosting on the show the editor of DeadSpin, which is one of the larger sports blogs that are out there, an older sportswriter, and [interestingly, and purely coincidentally] Cleveland Browns' WR Braylon Edwards. They all make very interesting, good points, though I actually found the most interesting ones to be from Edwards, making points from the athlete's point of view. The discussion they are having is about blogs in general, particularly as measured against the old media, on a number of different levels - from presentation to tone to accuracy to portrayal to responsibility. It's a fascinating discussion, well presented [save a few interruptions], and Costas is unsurprisingly the voice of reason along with Edwards. There are a number of good lines and points throughout; feel free to share your thoughts on it. ...who knows what will befall us now that two of the greatest forces in all the world are now one...dark forces from the nether regions of the Internets...a lone warrior from the far reaches of the modern Judaic frontier...it's alive...it's aliiiiiiiiiiiiiiiiiiiiiiiiiiive...SLIFKIN, THE BLOG!!! ...is a hallmark of just about every movie that Al Pacino has made in his cinematic career. Normally it comes towards the end of the film and acts as sort of an intense soliloquy of all the emotional elements that his character has been dealing with. It is one of his calling cards and he is quite adept at it. (Thank you, Rabbi.) I was warned not to write this here. I was warned. They warned me, "Don't post this up on that blog." But why should I heed such a warning when a People are silent and a national ideal lies all but dead? "Don't write about" this topic. Once upon a time a Jewish Community meant something! But I must write here, because we have not given ourselves what we should have. Until we can walk abroad and recreate ourselves, until we can stroll along the streets like boulevards, congregate in Shuls and Schools free from fear, our families mingling, our children laughing, our hearts joined -- until that day we have no community, no Am Yisroel. We can label ourselves a failure until that day. The first and perhaps only great blogger was G. He was, G of Jerusalem, and he lived some 2500 years ago, and he said, "All things good of this earth flow into the community because of the community’s greatness." Well, we were great once. Can we not be great again? Now, I put that question to Am Yisroel, and there's only silence. Yet, could not something pass from this simple concept to us? Could it not empower us to find in ourselves the strength to have the knowledge to summon up the courage to accomplish this seemingly insurmountable task of making a community livable? Just livable. There was a palace that was our communities. It was a palace! It was a palace and it can be a palace again! A palace in which, yes, there is Left or Right or Ultra or Modern or (horrors!) plain old Erlicheh Menschen…but ultimately Jews all -- subjects beholden to each other as well as to God, to make a better place to live. Is that too much to ask? Are we asking too much for this? Is it beyond our reach?! Because if it is, then we are nothing but sheep being herded to the final slaughterhouse! Do not go down that way!! Choose to fight back!!! Choose to rise, not fall! Choose to live, not die!! And I know, I know that this is within me and also within you! That's why I ask you now to join me. Join me, rise up with me; rise up on the wings of this battered ideal. We'll rebuild on the soul of the “Am”. We will pick up it’s standard and raise it high! Carry it forward until this community -- your community -- our community -- His community -- is a palace of God! Is a palace of God! I am with you, Am Yisroel. As today is our fourth (!) anniversary, it's as good of an excuse as any to continue this series. This is Part IX of a series about how I proposed to Serach. Part I is here, Part II is here, Part III is here, and Part IV is here, Part V is here, Part VI is here, Part VII is here, Part VIII is here. Part IX is here. Or, you could simply use the dropdown menu on the left side of the blog titled "How I Met Serach". We left off last time with Serach threatening to force me to eat raw fish. On our second date, that's exactly what she did. After night seder, I got a ride into Manhattan. Serach was staying in a friends' dorm room on the Upper West Side, where at the time there was a small kitchenette under the lobby. While I thought she was kidding, when I showed up, there she was holding a couple of rolls of sushi - less "fishy" ones, but nonetheless, this was raw fish. The truth was that I didn't really know what sushi was - I kept imagining slimy herring, while in reality, the sushi was anything but. After much consternation and stalling, I finally took the chopsticks and put a piece in my mouth... and survived. Somehow. After a few more bites, I actually started to like the stuff, much to my surprise and dismay. But I skipped a slightly important part. When I walked in, there were a few other people there. And those people, of course, were some of Serach's really good friends. The truth was it was unavoidable. One friend's job was to monitor the lobby and halls. Another was on her way in or out. And another had come to visit the monitor. But I think that any guy is always a bit wary of meeting his date's friends early on, knowing that this translates into an analysis of every breath he takes, every move he makes, every single day, every time he prays... and here I was, sitting down on a couch across from three of Serach's closest friends, talking. Fun stuff. Thankfully, somehow, I passed the test. It might have been my pathetic look when I saw the sushi; it might have been that I was about 50 pounds less than I am now. But Serach told me much later that one had commented to her later, not really joking, that if it didn't work out for some reason Serach should set her up with me. After the time spent in the lobby we went for a nice walk outside, and came back a couple of hours later. We sat back down with her friend the monitor and another one of the friends when another girl came into the room, with a guy... and they were both drunk. Serach was acquainted with but not really friends with the girl; after the girl wouldn't stop talking for a while, she turned to ask Serach who I was. Serach didn't feel like dealing with a drunk bugging her about her date, so she answered (to her friends' amusement) that I was her cousin. After a while, I believe the monitor friend - who was quite annoyed to have to deal with this - sent the girl up to her room and the guy she was with out the door. This actually caused a funny story later on when we got engaged - the girl saw Serach and asked who the guy was; Serach asked her if she remembered meeting me that night in the lobby. The girl made a face and said "You're engaged to your cousin!? ", before Serach laughed and explained that I was not actually her cousin and why she'd said it. All in all, date two was a success - next time, Central Park & Starbucks. It's always really difficult not to compare yourself to others. People and their accomplishments are all around us, almost in an in-your-face kind of way. So how do you measure your own value without using other people as a frame of reference? I was once having a conversation with someone and she mentioned that there is such a thing as a bechira decision vs. a decision that you make just because it makes sense at the time. A bechira decision, according to her, is a decision you make when nothing is pushing you in either direction - it's purely your own choice which determines which path you will take. You don't really know the bechira decisions of others and you may not even really know your own bechira decisions, but it is precisely those decisions which determine your true character. In a similar vein, a person cannot truly be judged based on their God-given abilities. It's what they do with those abilities that provides a true basis for judgment, and the more you work on your talents, even those which aren't your strongest, the more you are worthy of being judged based on them. If you don't put in any effort on your part, then what do those talents say about you? Not much. They are gifts, but they are not accomplishments. This way of looking at other people has really helped me realize - everyone is different. Everyone has different strengths and abilities, but just because one person seems to have been born a natural [fill in the blank] doesn't mean that person is better than me, it just means they are utilizing a gift from God. Although, then I struggle with - well, what are my gifts? Isn't a person's worth also including their God-given gifts? I'm not sure. But I think the point is - a person's worth is not measured based on what they do effortlessly. Even if, to the outside world, it seems as though a person is very accomplished, talented, popular, brilliant...whatever trait you may admire - their real accomplishments in this world are those things which they've worked hard to achieve. Their true worth can be measured based on the real, bechira choices they've made. And once I realized that, I started to be able to measure myself in the same way. Just because I'm not as naturally talented as some people or as well-liked as others or if I ever feel under-appreciated...that isn't a measure of who I am. In fact, the harder I have to work for things, the more they're worth and the more of an accomplishment they are. The bigger the struggle, the more success is worth at the end. And that goes for everything. And the harder the choice, the more it says about who you are. But since we can never truly know just how difficult things are for people, we can also never truly measure ourselves against them. I guess the real person we have to worry about measuring against is ourselves. It's just really, really, really hard to A. come to that realization B. internalize it and C. live by it. (Hat tip: Imma) I thought this was a very interesting interview - John Voight on his support for Israel, Israel, the Jews, and more. ...one could be forgiven for thinking so. Speaking at the 200th birthday celebration of Rabbi Samson Raphael Hirsch this past Shabbos, Khal Adath Jeshurun's Rav Yisroel Mantel declared that the philosophical credo of Rav Hirsch, Torah Im Derech Eretz, is not viable in the absence of its chief advocate. Rav Hirsch was a 19th century champion of Orthodoxy and the founder of Khal Adath Jeshurun's parent community in Frankfurt, Germany. Rav Mantel's declaration, which angered many in the community, came at a sit-down kiddush at Dr. Raphael Moller Hall in Washington Heights after Shabbos morning services. He said that only Rav Hirsch, a great man who knew the fine boundaries between what is religiously permissible and what is prohibited, could make Torah Im Derech Eretz workable. Our generation, he said, must follow today's gedolei HaTorah (great Torah leaders). After Shabbos, Dr. Eric Erlbach, KAJ president for over two decades, resigned. The Torah Im Derech Eretz philosophy calls for the active engagement between Torah and culture and society. Samson Bechhofer, a great-great-grandchild of Rav Hirsch, spoke first at the kiddush. The synagogue's choir conductor and a lawyer by profession, Bechhofer lamented the educational policies of the community's Yeshiva Rabbi Samson Raphael Hirsch school in recent years. "If the goal of our kehilla and yeshiva is to have all of our sons and daughters end up in Lakewood – and I use Lakewood as a metaphor – then I submit that we are not being faithful to our founder's philosophy or Weltanschauung, nor are we doing the future of our kehilla any great favors," Bechhofer said. Rav Mantel stood up and walked out of the hall at these words. He later returned and told the several hundred assembled that "grandchildren and lawyers" will not decide how to implement Torah Im Derech Eretz. Other speakers at the 200th celebration Shabbos included Rosh Yeshiva Rabbi Meir Tzvi Bergman (the son-in-law of Rav Elazar Menachem Shach), noted columnist Rabbi Jonathan Rosenblum, and Rabbi Eliyahu Meir Klugman, Rav Hirsch's biographer. Among their many remarks, Rabbi Bergman praised Rav Hirsch for his Chumash commentary, which has recently been retranslated; Rabbi Rosenblum lauded Rav Hirsch's philosophy of Judaism, from which, he said, many Jews can derive much-needed spirit and purpose; and Rabbi Klugman credited Rav Hirsch for teaching all of Orthodox Jewry how to live authentically Jewish lives in a world without ghetto walls. Rav Mantel also highly praised Rav Hirsch during his sermon in shul, reminding the audience that Rav Yisrael Salanter (1810-1883) once said, "Where is there a Gan Eden big enough for Rav Hirsch?" Speaking later at Seudah Shlishis, Rav Mantel credited Rav Hirsch for demonstrating definitively that Jews can plant the Torah in any culture. Torah Im Derech Eretz, Rav Shimon Schwab (rabbi of KAJ from 1958-1995) once said, "means the Torah's conquest of life and not the Torah's flight from life. It means the Torah's casting a light into the darkness rather than hiding from the darkness. It means applying Torah to the earth and not divorcing it from the earth." If The System is so messed up…if a large segment of society realizes this…if there is such frustration with the way things are…why is The System still the system of choice? LWY responded that he thinks it generally works, as most frum people over 19 are married. Personally, I don't think that that shows that the system works; not only are a large segment of the people who are married people who never utilized the system, there are also those who skipped the system somehow, those who married their high school sweethearts (whether they were allowed to have them or not), and those who "used" the system to date someone they were interested in already. Moreover, as most shidduchim are ideas that people think of and then "set up", it is hard to say that going through the whole process was somehow better than if they simply had received one another's numbers and just started dating on their own. Possible reasons that a given individual might think of and therefore they would choose the system. 2) Fear of being “ruined” within the system if one tries to date outside of it. 4) Believe it is the best route because it is more “tznius”. 5) Believe it is the best route because it “works”. 7) Lack of a decent alternative. 9) Discomfort with rejecting/being rejected face-to-face. 10) [Note: Doubtful] Actually enjoys the process on a consistent basis. I could go on with reasons why people might choose the system despite its many flaws. It doesn’t mean that the flaws don’t exist nor that they shouldn’t be discussed, and if possible, fixed. As I once put it to a friend - anyone who wishes to work within the shidduch system should feel free to do so. Similarly, all those who don’t wish to work within the system should feel free to do so. Finally, all those who choose either of those directions should not be negatively impacted any time they decide to utilize the other. Feel free to add on to/disagree with the list, and expound on any thoughts you have about the list in general or any part in specific. ...while we do some reorganizing here at SerandEz & Friends. Thanks for your patience! But, then good things start happening. Schools bring in specialists to speak to the kids. Girls become more self-aware of their own eating habits. Peers eventually become informed enough that they can help their friends who are bingeing and purging. Eventually, eating disorder rates drop significantly, as the short-term publicity results in the long-term benefit of awareness and the creation of solution-oriented programs, that remain in place as the pain of the publicity subsides. Since so many singles find their way to the SerandEz blog (and household), and there are so many fascinating discussions about dating and singles life here on this blog, I thought to direct your attention to a TV show shich debuted in Israel last night; Srugim. It's all about the religious singles scene in the Katamon area of Jerusalem. While the actors are secular, they do a fantastic job (perhaps too good?) of portraying religious singles life in Jerusalem. I wrote a whole post about it here, complete with video clips and all. Perhaps we could invite the director, Laizey Shapiro to do a TV series on the singles scene in the SerandEz apartment? ...seems to be the message being sent by some Kollels to their most senior members/prospects. The Jewish Worker, Life In Israel & The Wolf all deal with the topic of older individuals being denied entry into Kollel. There are issues that pertain to individual Kollelim and to the idea of Kollels at large. Very interesting discussions that are well worth some of your time. Bluke passes along some of the reasons given in the article. One of the reasons given is as follows: "Someone who is still just sitting and learning in kollel in their 40's is not going to become a Rosh Yeshiva, Rosh Kollel etc. The fact that they haven't moved up shows that they are not so successful." Elianna is currently doing a study of penguins and will be writing her dissertation on the personal behaviors of both penguins and pudus. Did they evolve from the same ancestor or do they both just like being personal friends with people (especially hippopotomi)? This and other questions will be answered in Elianna's newest book, "Penguins and Pudus: Personal? Or spies for the mafia?" Elianna (2) heard Kayla (2 weeks) crying, so she went up to her and said "Sh! Sh! Kayga Naomi, Elianna poh*!" So far, she's been really good with her. We'll see how long it lasts...! ...given the events in this week's parshah. Think of the various sects/groups/factions/divisions/wings/camps/parties/tribes within the current orthodox Jewish community. Okay, you got 'em in mind? (I know, I know you're still coming up with them...takes a long time, huh? Well, that's something for a different post). Now...given the choice, which ones do you think would choose to stay in the Midbar (desert) and which ones would choose to go into Eretz Yisroel? Think it through for yourself...carefully and honestly think it through. The answers may surprise you. Wow, I hope I'm not pushing a lot of good posts to the bottom here but I really want to write this before I lose the inspiration. Today was a huge milestone for me. Most of you probably don't remember this because it was back when my blog was still really new. Of course, that also came before this. I think that last thing, coupled with just general lack of confidence in myself that I had been struggling to overcome even before that happened, created an intense, intense fear and anxiety about driving - especially on the highway. So yes, I had driven on the highway before. With my dad, that is. Today was my first time ever driving on the highway by myself. And you know what? I'm not going to say that the entire time was a picnic, because there were some parts where I was scared and uncomfortable, but it really was not as bad as I had worked myself up about it being. I left my house around ten after two. Destination - The Pond, The Fortress of Super Sketch, Home of the Blogfather, Serach and Ezzie's apartment, whatever-you-want-to-call-it. The entrance to the highway is about two minutes from my house so I didn't have too much time to think about it in the car before I was actually on the entrance ramp. I had to forcibly will my hands to steer the wheel so that I'd have no choice but to go onto the highway. And then, before I knew it, I was on. Just like that. I was driving on the highway. About twenty-five minutes and three highways later, I arrived at Serandez. I even have a sign to prove it! And then I got to hang around and help rip things up, which was fun. And we even squeezed in two rounds of boggle before I had to go (Apple was there, too). The real adventure was the trip back. I started off okay. Both mapquest and Ezzie provided me with directions on how to get onto the highway and then how to get home from there (again - three highways). The problem was - there was a lot of traffic and I hadn't realized that if I stayed in the right lane, I would automatically end up on a highway I didn't want to be on. By the time I noticed this, it was too late. I was a little nervous because I had absolutely no idea how to get home from the highway I'd just gotten onto but I figured if I got off at the next exit, I wouldn't be too far away from getting back on track. So I got off, but then didn't really know where exactly I was. I knew sort of, but I had no idea how to get back onto the correct highway. So I pulled over and called Ezzie. He very patiently gave me directions and, even though I was still nervous (because I always get nervous when I'm driving alone and don't know exactly where I'm going and can't visualize it), I got off the phone and went the way I was told. Thankfully, I had no trouble getting back where I needed to be. Unfortunately, I also had no idea whether I was supposed to be going north or south, so when the highway split and I had to decide between the two, I chose the wrong one. I didn't realize I'd chosen the wrong one right away, though. It was only until I saw water, signs for the Bronx, and the Throgs Neck Bridge looming up ahead that I felt my heart sinking. Actually, I felt like I was just going to hurl. I did not want to go over any bridges and I did not want to end up in the Bronx. I was very, very scared because I couldn't even see anywhere to get off. It seemed like I had no choice but to go on the bridge. Luckily, there was a little marina on the side of the highway so I quickly pulled over and called Ezzie again, this time shaking all over and nearly in tears (and then, yeah, in tears later). But after getting directions again and being told a few times that I can do it and that I'll be fine and after calling my mom, I braved the highway again. That was the worst part of the entire trip. I was so panicked. The thing is, I don't normally panic when things go wrong. I'm usually able to keep my cool and deal with the situation. I think. Depending on the situation, anyway. But certainly about getting lost - I always know I'll end up fine in the end. But not when I'm lost while I'm driving and especially not when it's taking all my energy just to feel comfortable driving on the highway when I'm not lost. I was tired and frustrated and just wanted to go home. I was scared to get back onto the highway. I wasn't precisely sure where I'd end up and I was very close to the bridge. If I missed the exit, I probably would have no choice but to cross the water. In my mind, I was irrationally hoping someone would just come get me. But I knew that was ridiculous. Ezzie wasn't going to drive all the way out there and neither was my mom - and anyway, even if they did, there would be two drivers and two cars so I'd still have to drive. No, there was no choice. I had to face getting onto the highway again. I had to face finding my way when I wasn't exactly sure what to do. And I did. I faced it. I got onto the highway (which was scary on its own because there was no entrance ramp from the marina, I just had to get on in the middle of all these cars flying by), got off at the next exit (I almost didn't because I was confused for a minute but then, noticing the looming bridge again - which was actually very pretty, only not when I wanted to get away from it - I quickly made sure to get off), followed Ezzie's directions (a bit uncertainly because I wasn't sure I'd gotten off at the right place), messed up a little but fixed myself without calling again for help, got back onto the right direction on the highway and, after a lot of traffic, ended up back home. But once I got onto the part of the highway I was comfortable with, I was able to think a little bit without worrying whether or not I was following the right signs. That's when I realized - I'd just gotten a real, physical lesson about dealing with problems. It's something we all know - friends can help, but you're the one who ultimately has to overcome whatever obstacle is in your way. No one can do it for you. It comes up most often when dealing with advice and emotional issues or big decisions. Here, I experienced it literally. I was the only one in the car. I had no choice. I had to drive if I wanted to get home. I had to face anything and everything in my way because if I didn't, I'd be spending forever on the side of the highway. And when I was lost on the way, I could call for help, like I called Ezzie, but he couldn't actually drive for me. He could just direct me. I had to do all the driving. No one was coming to get me. No one was coming to do anything for me. I had to do it all myself. And I did. And I'm a better person for it - or a better driver, at least. Because I'm not afraid of highways anymore. I'm really not. I'm still nervous about getting lost, but I spent so long wandering around on different highways - how can I still be afraid of them? I'm stronger. I know I can face things and I know I can succeed. Getting lost isn't failing, it's just learning. Yes, I was shaking all over, yes, I was scared, but it's okay. I still did it. I didn't wuss out. And that is bravery. I used to think I was the biggest coward because I was so afraid of things. But now I realize - being brave isn't having no fears. It's being terrified but doing it anyway because you know you have to. I think I definitely grew from just this one experience. I gained a bit more confidence in myself that I didn't have before. And it was hard to get there, definitely. Growing pains are real, even non-physical growing. But growth doesn't come without pain, without fear, without struggle. Then it wouldn't be worth anything - if it came easily. It wouldn't be real growth. I had to face things I was terrified of and the more I faced them, the more I believed I could do it again. The more I believed I could face other things I'm terrified of. The more I believed in myself. This lesson for me is certainly not over. It's really only just begun. But I'm getting there - I'll get there eventually. It might require encouragement and guidance still, but that's okay. It's okay to have help. Anyway, thank you to Ezzie and Apple for making me a "you did it!" sign - it actually made me feel really good - and thank you a hundred times over to Ezzie for being really patient with me when I was horribly lost and for basically ensuring I didn't end up in some random place somewhere. So, yes. And, uh, here's to better driving times in the future! I got home from work yesterday, and it sounded like someone was in the shower, but then my husband walked out of the kitchen. "Something's wrong with the toilet, I called C. (apt. handy man)" he told me. Now, our building is old. Reaaaally old. For example, we only pay electricty and gas, since the heat and water in the building are configured in a way that can't be allocated to each apartment. The toilets are also old. They look and sound like the kind you'd find in a public restroom, with a silver handle you push down, and no tank. The sound is deafning. So we go into the bathroom and he shows me how the water in the toilet is 'running'. The same type of thing on a normal toilet can be fixed by jiggling the handle or opening the tank and figuring out what's not closed. (I once fixed a toilet using nothing but a pony holder). But with out toilet there wasn't much to work with. We tried the sink, and the water pressure was very low. So we waited for C.
C. showed up and took a look at everything. He came to the same conclusion as us. There wasn't anything that could be fixed from our bathroom, but he did get a call that the apartment above us had a problem as well. He went to check it out and it was the same situation. He said he would try to call a plumber, but it was pretty late in the day. He wasn't able to get anyone to come out, because no one was trained or experienced in such "antique toilets", "but someone should be there by 8am tomorrow morning" he told us. He then came back to the building because the lady downstairs had a different problem, her toilet was contantly flushing water, which explained the lack of water in the other 2 apartments. (Whenever someone turns on water, or flushes a toilet in the building, it lowers the pressure in the sinks and showers) So he went down to the scary boiler room next to the scary laundry room to turn off the water, because the lady downstairs' toilet's noise was driving her crazy. In our apartment, it stopped the running but that meant that it turned off our water too. So C. turned it back on. He stopped by as I was resting from my toilet induced headache and turned the water off and on. The flushing stopped, but then the toilet did a ghost flush, but it's been quiet for the past few minutes. No one knows how to fix it, it's not normal!!!! Hehe. I'm think I'm going to enjoy this far more than she will... I was interviewed via e-mail in midst of a busy day trying to reorganize and clean out our apartment, and probably should have been a little more careful in my wording because I think I was slightly misunderstood on a couple of counts. But anyway, the Jewish Week asked me a few questions in putting together a piece about Bad4Shidduchim, and it's a reasonably good assessment of the blog. “Bad4 takes an almost Seinfeld-like approach to the ‘study’ of shidduchim,” says Ezzie Goldish (aka SerandEz), a 24-year-old married blogger from Kew Garden Hills, Queens, who regularly comments on BadForShidduchim and, along with his wife, Serach, has hosted several Shabbatons for frum bloggers. Bad4’s posts are approached “from a point of view that really allows anyone to enjoy the posts, whether they’re young or old, across the [religious] spectrum from chasidish to left-wing Modern Orthodox,” he says. The Seinfeld line kind of loses sense without the next line, which was "[by] throwing a spotlight on any individual aspect of the dating process, and when you focus on one aspect like that, odds are it's going to be pretty funny." It's a good piece, check it out. Many people denote one night in their lives as the perfect evening. Girls get dressed in beautiful fancy gowns. Men in black formal wear. Escorted in stretch limousines driven by a professional driver. Bad food, energetic dancing and lots of mingling fill the night. Nope, not talking about one's wedding. Apparently, the photo deemed worthy of carrying in one's wallet is from a different night. That's right. Prom. What are your prom might memories? And for those of you whose schools didn't host a prom, what were your prom night fantasies? Moments before Yosef Abrahamson, 16, accepted an award for the essay he’d written in a competition sponsored by the Police Athletic League, an officer approached him to complain about his fedora. The hat, an essential wardrobe item for Hasidic men, was gaudy, the policeman told him, and what’s with all these kids today and their nose rings and their attitudes. A second police officer, overhearing the conversation, came over to steer away the first one, who reappeared a few minutes later to apologize. He’d never seen a Hasidic Jew, he told Yosef. I thought this post was awesome. Check it out. The assistant-to-be hopeful stood by the door, looking slightly overwhelmed. First taking in the entire scene of flying children, and then directing her attention to each individual commotion, I could see her gulp and almost heard her thoughts screaming, "Will my class be like this too?? This is nuts!! I can't do something like this...." The director, well familiar by now with my little brood, just smiled knowingly at me and proceeded to usher the poor girl down the hall to a (thankfully for her) much more dignified and rather dull class. I chuckled and turned back to my children. AsI surveyed the classroom once more, I tried to picture purely what she saw: Children being very loud, leaving their seats, jumping up and down, making trouble and messes and who knows what. And to be very honest, that's exactly what was going on. But things were really very, very different from what she perceived. Because although it seemed to any outsider like unrestrained chaos, there was in fact a very strong backbone of stability and mutual understanding in my class even at the exact moment that they looked so positively flying. Hello! And welcome to the First Ever Interactive Blogging Poemathon - otherwise known as the FEIBP (pronounced Phoebe. The P [of FEIBP] is silent). FEIBP is brought to you with much rhyme and rhythm by bloggers-by-day-poets-by-night SJ and Erachet. What, you may ask, is a poemathon? The way it works is we start you off with six lines of a poem. Then it's your job to continue! You can comment with two more lines, or four if you'd like, provided they comply with the rhyme scheme established by the original four lines. Rhyme scheme is basically the pattern of the rhymes. In this poem, every second and fourth line will rhyme (abcb) so that's the rhyme scheme. When you comment, you should add on to the poem based on whoever commented above you. We'll start with a simple poem, since this round of FEIBP is the First Ever. I think most people suffer from fear of the unknown, personally... though some revel in it. This week's question is up to the left as usual! ...but seriously, WHAT - THE - HELL!! Why do I have to feel like I am being farhered every time I go to my shver’s house in Brooklyn? I understand that he gives us money each month and we appreciate that very much. But does that mean that I have to be subject to questions about what I’m learning and pressured to say vertlach on the parsha every time we visit? My in-laws are very nice people. They shower my wife, 5 children and me with gifts, they bought us a car, among other things, and graciously give us a monthly check to keep us afloat. Is that the reason that my father-in-law feels compelled to quiz me every time I come to his house? I mentioned this issue to a friend of mine who said that he experiences the same exact thing. This friend encouraged me to write this letter to the Yated. Actually, he’s pushed me for months to write something, but I never got around to it. Perhaps there is a father-in-law out there who can explain it to us. Why do you have to bombard us with your questions on our limudim and with your vertlach on this inyan or that inyan? It is not that we aren’t interested. It is just that we somehow are made to feel that we have to constantly be ready for our next “exam” when we meet you. (This is surely not as bad as a different friend’s shver who actually makes him fax a shtickel Torah to him once a month. This friend lives in Yerushalayim, while his father-in-law lives in New York.) There are other issues about in-laws that my friend wanted me to share, but for now I think this one will suffice. C. R. & M. F.
--Nice. I'm not sure what C.R. stands for, but can make a pretty good guess as to what M.F. represents. --Imagine how put out they would feel if they knew (or actually believed) that a percentage of their Schar Limud (Merit for Learning) was going to that very same Father-in-Law. --One wonders how slow these young men, who for goodness sake just want to be left alone, would be to question the business acumen of said Fathers-in-Law if the dollars coming their way lessened. --"It is not that we aren’t interested. "; the ironclad rule in sports is that as soon as somebody says "it's not about the money", you can be 100% sure of one thing...it's about the money. Do with that what you will. To quote that great orator, Dwayne "The Rock" Johnson...Know your role and shut your damn mouth. In the words of Livia "Grandma" Soprano...Oh, poor you! A very Happy 35th Anniversary to my dear parents; we are glad you're enjoying the pictures and videos of your granddaughters, because that's what you're getting as your present. Rivka (who probably will never see this), who despite being in the middle of midterms in her summer courses and working, dropped everything to spend Shabbos in the hospital with Serach and Kayla, then helped tremendously in getting her settled in at home and with the Shavuos meals. Rea (who slept over), Apple, iPay, and Groovin's cousin YM for keeping me company Friday night and helping with Elianna. Apple - who just celebrated a birthday!! - came over as Shabbos ended so I could rush to the hospital immediately afterwards to visit Serach for a few minutes... then stayed for hours when it turned out Serach was able to be sent home, helping Serach to get settled in. 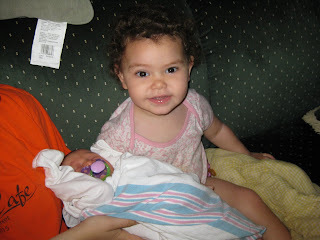 Oh, and while we were at the hospital, she cleaned up the apartment, folded all the laundry, and played with Elianna. Princess D'Tiara not only managed to visit Serach in the hospital, but helped take care of Elianna (and brought her a toy to occupy her) when I came Friday, did a wonderful swaddling job (we have video! ), and then proceeded to help out on Yom Tov, even cooking a really good heart attack on a tray that was all eaten. Meanwhile, the amazing Raggedys just continued to outdo themselves, hosting us for a meal fit for kings and even letting our own guest Pobody's Nerfect to crash on their couch the whole afternoon. Speaking of PN, she only spent three days helping out in every which way, from Serach to Elianna to Kayla. Then there are all the others who helped out in numerous ways, from my in-laws, to the people who hosted Elianna and myself for Shabbos meals, to the countless friends from KGH who offered meals and offered to make meals, to those who came to wish Mazel Tov or visit... Kew Gardens Hills is really an impressive community. So... thank you all so much, and hopefully at some point in the near future this blog will get back to what I want it to be, which is a little content in addition to all the fun. It's so hard to not spend time writing about things like this great panel discussion I heard last night at Young Israel of KGH on the high cost of education... but I have other things to do. Have a wonderful day! As Moshe wrote in the previous post, she was born at 4:31 p.m. Thursday afternoon, and weighed 6 pounds 12 ounces and was 19 1/4 inches long. She and Serach are bH healthy and doing well. Ezzie named the baby at their local shul in Queens this Shabbos. 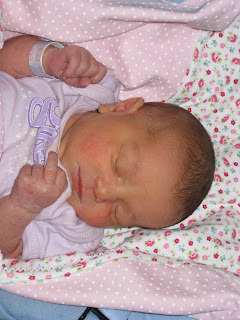 MAZAL TOV to SerandEz on the birth of a baby girl!!!!!!!! Edit: A minute after I put this post up the following conversation took place. Apple: you stole my post dude! several Gedolim both in the North America and Israel have forbidden the use of "Sabbath-mode" ovens on Yom Tov*. See the details at Wolf, including the Kol Koreh that the Rabbonim signed explaining why; R' Heinemann's original teshuva that allowed them is here. I'm more curious to see how it plays out from a practical point of view: Assuming R' Heinemann stands by his psak, will we see people stick with it? Or will the majority of the people pick the more machmir point of view simply to be "safe". Of course, it's not a great example, what with this being an easily verifiable set of facts, unless the question is whether that is actually chillul Shabbos, but it's still interesting. Rav Heinemann, shlita, stands by his Psak that it is permissible to raise and lower temperatures on YomTov on ovens equipped with that particular Sabbath Mode feature. Please see Star-K website: http://www.star-k.org/cons-appl.htm, or call our office for details about your particular model. Star-K will, in the next few days, post an audio presentation from Rav Heinemann explaining his views. For those who wish to refrain from placing their ovens in Sabbath Mode and still use their oven on YomTov, please be aware of the possible serious "Michshol" on many models. Opening the oven door will immediately shut off the heating elements, an act clearly forbidden on YomTov. Thus, even if you don't raise or lower the temperature, it is still important to keep the oven in Sabbath Mode. So now the question is only what the community will do. Interesting. Let me state at the outset that this obviously contains a caricaturization of The Shadchan. There are many fine people out there who do many wonderful things in their undying, and more often unrecognized & unappreciated, efforts on behalf of the dating public. Let a Shadchan in your life? I was asked to post about this, and I think it's more than worthwhile - in fact, important, considering the way cancer is too often 'not talked about' in the frum community. I'm 21 [last week] and I was 16 when I was sick. I wrote a diary then, but started putting it online last summer when I realized what a demand there is out there for people to be able to read or ask about cancer while remaining anonymous. The book comes out tomorrow, and from a few excerpts, I think it's going to be fantastic in a number of ways - and not just for people suffering from cancer, but for the rest of us as well. I'm going to post a couple of excerpts below to check out; Tzipi will be hosting a book signing at Eichler's (click on the attached photo). One of the things I especially like about the book is the refreshing honesty that comes through in the writing - this was not written for an audience, but as a collection of thoughts and musings on living as a cancer patient in the frum world. There are clear lessons to be learned, even just from the two excerpts below; please check them out, and check out the book as well. Excerpts on expand. She's BALD Under That Thing!!! Two days before Leiba's wedding was five days before Purim, and my mother needed something from the grocery that night. She sent me to a supermarket a few blocks away and I went over in my bandanna. It was nine at night and I didn't want to get dressed just to pick up a bottle of milk. I figured I could leave my house and be back within ten minutes. I was wrong. It was erev Purim and the store was mobbed. Everyone was doing their last minute shopping for mishloach manos, and it took me just ten minutes to get to where they kept the milk. I got a lot of stares as I was navigating my way through the crowds, but I just blushed and ignored most of them. There were some kids who pointed fingers, but I just pretended not to notice when their mothers told them to shush. As I got in the line to pay, a lady stopped me. She was wearing some ratty old housecoat and a tichel and she had the nerve to tell me, "I don't know where you are from, but here we don't dress this way." I felt like I had just been slapped. I turned to her and said, "It happens to be that you are lucky I'm from this community because you are setting a pretty poor example for what the people here are like. If I didn't live a few blocks away, I would probably think that all people from this place were as snobby and judgmental as you are." The lady looked really angry when I said that and told me she wished she knew my name because she wanted to tell my school what a chillul Hashem I was making by coming out in a bandanna. I recited my Tehillim name and told her that if she kept me in mind when she davened sometime it would be like a chessed for the day. You were able to hear the entire store take a collective gasp. The cashiers were not doing anything, the lines weren't moving. Everyone was busy staring at our confrontation. I boldly went on to tell her that it did not take much of a brain to figure out why I was bald and I didn't think it took that much common sense to keep quiet about it. She still had the nerve to tell me that even if I were sick, I still had to be responsible and make sure to look good when I went out. I had to get myself a nice sheitel because otherwise people would stare. I couldn't believe her guts, so I countered with some of my own and asked her if she wanted to pay for that sheitel. She said there were plenty of cheap synthetics out there. I fought back and said, "Look, I'm a sixteen year old kid. You think there is a single person in the frum community who will not recognize a sheitel when they see one? What sixteen year old kid wants to be pointed at? If I'm going to get a wig, it had better be the most amazing and natural looking one on the market so that NO ONE is going to be able to tell that it's not my hair. Unfortunately there is no such thing as a sheitel not being recognized anymore in the frum world, and people like me don't spend that kind of money on those amazing sheitlach anyway. "Instead, I am very comfortable with what I look like and what I am going through, and I am not shy to walk out and be myself no matter what anyone thinks. They are pointing at me anyway. Let them point and say, 'I admire her guts', instead of, 'Poor kid who has to wear a sheitel.'" The woman still didn't know when to stop. She called me on the fact that I was exposing her kids to something they didn't need to see. Oh, that got me so angry! I asked her why it was okay for her kids to daven for me when I was in the hospital but when I was well enough to walk around, her kids should not be exposed to the likes of my bald head. If anything, her kids should be coming to visit people like me in the ward so that they'd grow up with an understanding of what they were davening for instead of being repulsed and afraid of a sick child. I wanted to know why when I was in the hospital no one cared if I read non Jewish books in the hospital or watched movies from my bed. I wanted to know why no one was bothered that I did a bunch of stuff that was not the usual for a frum girl in everyday life. And then I wanted to know why it was that now, when I was finally well enough to be a normal daughter again, and run errands for my mother at such a hectic time, my bandanna was the problem. The store was drop dead silent. I'd had enough of talking, so I just walked past everyone standing in line before me, dumped my bottle of milk on the counter, paid, and walked out. As I reached the door, I turned back to that poor, delusional lady, and told her, "Before you make a comment like this again, get your priorities straight. And by the way, thanks for all your support." Then I walked home and completely put the matter out of my head. I couldn't help it if people wanted to be stupid. I didn't even tell my parents. As it turned out, they told me. So Cancer is all we have in Common….Let's get Married! The next day, I went to school with a baseball cap on top of my sheitel even though some teachers commented that they didn't like when I did that. Feeling so self assured because of that stupid lady incident I had taken care of the night before in the grocery store, I brought a bandanna along in my backpack just in case. I figured that I was going to just take the whole sheitel off and put on my bandanna if anyone made a single comment to me again. Thankfully, no one commented, but at the end of the day it started pouring as we were leaving the school building. Without thinking, I slipped off my sheitel and put the bandanna on instead and walked home with my wig in my bag. The teacher who had been quite nasty to me about the cap stood there and stared with her mouth open as my friends all walked me home. Thursday was Taanis Esther and that night was Leiba's wedding. I was so excited to finally feel good enough to dress up again and go out looking good. I spent the entire day looking at my gown and doing my makeup over ten times and then finally going over and getting Leiba's makeup artist to do it for me, and then doing it myself again. I thought I looked amazing at Leiba's wedding, but when I looked back at pictures I realized that as good I looked, I still had a long way to go before looking completely healthy. In the middle of the dancing, someone told me that my father was looking for me at the mechitza, so I went over to see what he wanted. I was a little annoyed when he introduced me to my brother in law's friend, a boy named Sholmo, who was also sick with Hodgkin's. He left us to talk about what we had in common. I felt so stupid. We cancer survivors aren't always on the lookout to meet other survivors and talk about chemo. We like to live normal lives and talking about chemo is tiresome and not what we're about. I think people thought that two chemo patients must always be meant for each other because they have something to major in common. I really didn't think chemo could be a common denominator in a relationship. I felt that the relationship could be a lot stronger if based on what we both got and learned from our experiences rather than the experience itself. Two people don't have to go through the same rough ride in order to make them right for each other. What makes them suited to each other are the similar perspectives on what they have gone through individually. It was fine talking to Shlomo, but I walked away feeling he was "just another kid with cancer". I had nothing in common with him. I think my father was slightly disappointed that I didn't want to marry him on the spot. I hoped that when it came time for me to look for my basherte, people would be understanding of the person I was despite the "damages" inflicted upon my resume because of the cancer. I thought I had a lot to offer because of what I had gone through, and I was worried that I wasn't going to be given the chance to be a normal kid because the people around me didn't see me that way. It hurt to think of all the people out there who must be having such a hard time finding their basherte because they were being stereotyped. Cancer patients are the same as mental patients for all the people around me seemed to care or know or care to know. I was still too young to be overly concerned with this issue, but I always wondered how people dealt with it. Meeting Shlomo really made me think hard about it, and then later when Yossi asked what we had spoken about, I had to wonder about him. What was life like for him? He was a divorcee who wasn't either getting set up with anyone half decent. Being divorced meant that his marriage wasn't basherte, it didn't mean he was a bad person who deserved to be a second class candidate for marriage. I was shy to ask him about it, but I was sure it was an issue for him. There had been so many times where he had said he didn't believe he deserved half the problem cases he was set up with. He said that he felt like a regular guy and he wanted to be considered one. I'm not sure if I understood him because he made sense, or just because I was in the same situation- on the other side of the coin. When I spoke to people about this issue, many agreed with me, but still would never take that step and go out with someone they didn't think was in their league of perfect people. Then there were others who insisted I didn't see the other side of things. Someone I once spoke to said she would never trust anyone who had an interesting background because people tend to lie about medical conditions and such. I heard what she was saying, but then again, people lie all the time when it comes to shidduchim. How many stories did I know about couples who were top kids and then after they got married all the secrets started to come out? I knew there wasn't any right or wrong way to approach this issue, and that I was going to have to deal with it when my time came in the best way for me. But that night, even at sixteen, I felt indignant, maybe a little hurt, and also a bit sorry for myself. I interrupt this serious, meaningful, and interesting blog postingness with a public service question. With Shavuos around the corner...am I the only Jewish person out there who doesn't like cheesecake?! Because it sure feels that way! Please tell me there is someone else who also doesn't think cake is supposed to taste like cheese! Foucault said that punishments until the end of the 18th century were public (public hangings, walking around with signs, stocks) where as today's punishments (death penalty, jail, fines) are not seen by the public. Once upon a time the king was seen as having god given power and few would think to challenge him. The public punishments were a very in-your-face way of deterring people from rebelling against the king's authority. The French revolution (1789) was very instrumental in changing things. Secular ideas started slipping in. People demanded equality. And the king was seen as more of an equal and someone who was empowered by the people. The elite still wanted to rule over the lower class, but had to be more subtle so as to avoid an uprising. Laws and punishments are there to keep people in line with what the ruling class wants. Laws define who and what is acceptable and the punishments are there to normalize the people who would otherwise not toe the line. As always, this week's is up to the left. Enjoy! Those with a “liberal outlook” who “reject the idea of absolute truth” were more accepting of cheating at school, according to another study, involving 291 students and published in the Journal of Education for Business. A study in the Journal of Business Ethics involving 392 college students found that stronger beliefs toward “conservatism” translated into “higher levels of ethical values.” And academics concluded in the Journal of Psychology that there was a link between “political liberalism” and “lying in your own self-interest,” based on a study involving 156 adults. Liberals were more willing to “let others take the blame” for their own ethical lapses, “copy a published article” and pass it off as their own, and were more accepting of “cheating on an exam,” according to still another study in the Journal of Business Ethics. I think we've seen evidence of these ideas all over, including the J-blogosphere and the media in general. When people don't believe that absolute truth exists, it makes it much easier to rationalize certain actions - much more of an "ends justify the means" approach. This is true from waving off plagiarism as not a big deal to the major news media organizations justifying false stories because "the points the stories made are still important/true". Certainly one could argue that there are instances where believing in absolute truth can have negative consequences, but it does not take away from the idea that not doing so results in dishonesty, cheating, and the like. Again, it's an interesting piece, check it out. My apologies for interrupting the highly amusing comment thread on why guys don't should compliment girls on shidduch dates...yet due to the importance of today to the Jewish people, I wanted to remind the SerandEz readership that today is Yom Yerushalayim -- Jerusalem Reunification Day. 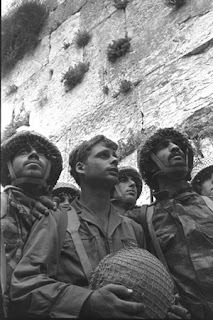 I posted about it here on my blog, along with the audio recording of the IDF troops racing towards Har Habayit, the shofer blowing by Rav Goren, the recitation of Birkat She'hechiyanu, and the joyful -- almost inconceivable singing of the Hatikva beneath the newly liberated Kotel 41 years ago. You too can live the dream...there are still spaces on Nefesh b'Nefesh flights! PS: Don't forget to see the JBlogosphere float from yesterday's salute to Israel Day Parade. I actually have mixed feelings on this post by Wolf, but I lean his way. So, now we've come to the point where if you dare to compliment your date on how nice she looks, if you even think to acknowledge and appreciate the effort that she puts into looking nice, if you have even a single thought as to her physical appearence, you must be a "sick, one-track-minded pervert." So, what does that leave? Why even date? The issue at hand is a couple of dates who were broken up with immediately after complimenting their dates (on date number four) on their appearance. Now, we've had friends who have noted discomfort with dates commenting on appearance earlier on in the process, but that was when a guy talked a bit too much about her clothes/appearance on a second date, for example. A simple "you look very nice" generally should be okay, certainly after a few dates. Dating is not a cold business transaction (or at least, it shouldn't be), and showing feelings, caring, and appreciation for one another should be encouraged, not shunned. Of course, every date needs to try and be aware of where the other person is in the relationship, and understand that perhaps the person they're dating might not yet be quite as comfortable as they are. And they might not appreciate an overly specific compliment too early on, particularly about how they look. However, a reasonably given, not overly specific comment that someone looks nice should be taken as it is meant - as a nice compliment and gesture of appreciation for how the person is dressed, not as the musings of a pervert.